For CRGC Members and Friends! 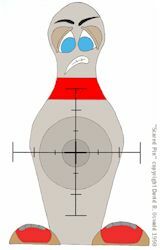 With bowling pin shooting, accuracy is critical. The kill-zone of the four pound pin is about the size of a 12-ounce beverage can. At 25 feet, it is not easy. The real challenge is to get one’s five heavy bowling pins off the table during the distraction of five other loud and sometimes rapidly firing handguns. Hint: Your firearm and ammunition must powerful enough to drive the 4-pound pins back a long three feet to be knocked clearly off the table top. The tables are made of steel and have a thin shelf over them. For the centerfire events, the five pins are positioned on the table so that three pins are in the middle of the lower main table, and two pins are on the shelf. The pins on the lower section have three feet of an often wood-chip and bullet-strewn table behind them, and the top two pins have air behind them. The .22 rimfire event is run the same way, except that the five pins are placed on the lower level of the table at the back edge, and the time is shortened to a mere four seconds. When the shoot starts, the pins are new and weigh four pounds each. As the shoot progresses, the pins get heavier as they fill with lead. They are used until they can no longer stand up. The course of fire consists of six shooters 25 feet away from their individual tables. The shooters can start with their firearms on target. At the start signal, the eight-second electronic timer starts, and the shooters all fire together, trying to get all five of their pins to be knocked off the table. Yes, the pin must be completely off the table to count as a hit! At the end of eight seconds, all firearms are unloaded and then actions are open and made safe. Then the scores are taken – any pins left on the table is not counted as a hit. After the scores are confirmed, the shooters are cleared to go downrange and set up five more pins for the next shooters. The next six shooters are then called to the tables and the cycle continues until every shooter has fired at six tables. The top score is therefore 30. Each time you shoot, you are at a new table so that no one will have an unfair advantage if one table has heavier pins than those at another table. After everyone has shot, one-on-one shoot-offs will be used if necessary to break any tied scores. First, second, and third-place trophies are then awarded. See this video of one of our tie-breaker shoot-offs. While watching it, keep in mind that the first person to clear their table of all the pins, wins! Pin-shooting is the ONLY handgun sport that requires speed, power, and accuracy. You won’t find this in today’s IDPA, IPSC, bullseye, steel plate, or any other handgun sport. The participants are are always friendly and jovial, and the staff is professional and safety-oriented. Finally, the event is just as fun to watch, so come and join us! This is a 6 shot revolver. Iron sights and not optics. Any gun that will not fit into the other two centerfire classes, such as pistols or revolvers with optics such as red-dot sights, compensators, etc. Either red dot optics or iron sights can be used for the .22 rimfire event. The shoots this year will be run in the morning, 8:30AM sign up. Shooting starting at 9:00AM and should end around 12:30 to 1:30PM, depending on the number of shooters. © 2018-2019 Chester Rod and Gun Club. All Rights Reserved.